The team led by the University of Edinburgh found the immune system plays a key role in the process. 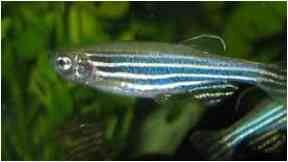 A team of scientists led by Edinburgh University believe tiny zebrafish hold important clues in the search for treatments for Parkinson's disease. Research using the tropical fish has revealed how key brain cells that are damaged in people with the neurological condition might be regenerated. Parkinson's disease occurs when cells in the brain responsible for producing the chemical dopamine are destroyed. When these cells die, or become damaged, the loss of dopamine causes body movements to become impaired. Once these cells are lost from the human brain they cannot be repaired or replaced. Researchers found that in zebrafish, dopamine-producing nerve cells are constantly replaced by dedicated stem cells in the brain and the team found the immune system plays a key role in the process. They said understanding the immune signals that facilitate replacement of these nerve cells could hold vital clues to developing treatments for people. Dr Thomas Becker, from the University's Centre for Discovery Brain Sciences, said: "We were excited to find that zebrafish have a much higher regenerative capacity for dopamine neurons than humans. "Understanding the signals that underpin regeneration of these nerve cells could be important for identifying future treatments for Parkinson's disease." The study has been published in the Journal of Neuroscience and was funded by the Biotechnology and Biological Sciences Research Council and the Medical Research Council.